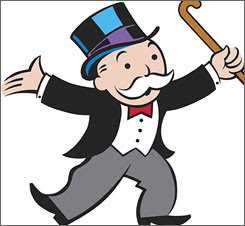 NYC Educator: Do Not Pass Go, Do Not Collect $200. Go directly to the rubber room. That's what the city told Harlem math teacher Mike Thomas last week. Mr. Thomas received some unexpected support from his students, who demonstrated outside the school in protest. "He's very dedicated, will stay after school. He's always there for tutoring, organizes the chess club," said student Stevon Garcia. Does that allegation sound like something that requires immediate removal from the classroom? Are they worried Mr. Thomas might look at other records? Couldn't they just lock the file cabinet? I know of someone who had to sit in the rubber room for a year for the offense of using a DoE fax machine. She was eventually sent back to work, but it does seem wasteful to have made her sit there. The costs of the investigation seem a little over the top as well. Perhaps they could've simply billed her for the call (and even for the wear and tear on the machine). I'm fairly certain she would've willingly parted with a quarter, or even a dollar, to avoid sitting in limbo for a year. The city could've turned a neat little profit on this incident, rather than wasting a year's salary. Now perhaps Mr. Thomas is a modern-day John Dillinger, posing as a schoolteacher during the day to collect health benefits. Who knows? But if that were the case, it may have been better to notify the police (even if it adversely affected his school's grade). Meanwhile, Mr. Thomas' students have no idea why their teacher is gone, and it's entirely likely, despite NY 1's source, that Mr. Thomas has no idea either. Wouldn't it be a good idea to require the DoE to at least tell people why they're in the rubber rooms? It seems somehow un-American to order people out of their workplaces without even letting them know why.